The Russellville Lady Whirlwinds kept hanging around against the Bryant Lady Hornets freshman team Monday night at Bryant Middle School gym. 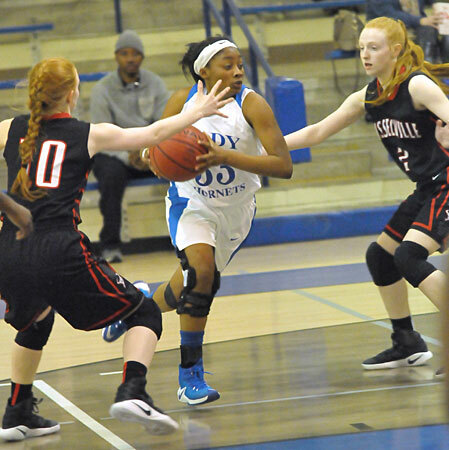 But, down the stretch, the Lady Hornets’ defense put the clamps on resulting in a fourth-quarter push that made it a little more comfortable on the way to a 39-26 win in Central Arkansas Junior High Conference play. Russellville never led in the game but just wouldn’t go away behind sharp-shooting guard Cara Davis, who led all scorers with 18 points. The lead grew to 12 late in the third quarter but Davis scored twice in the final 30 seconds to make it an 8-point game. 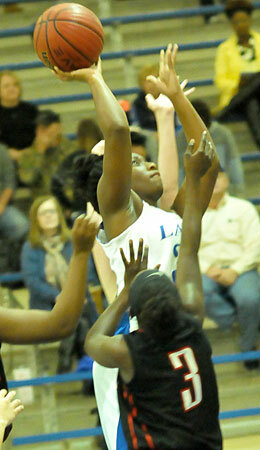 But Davis only managed 3 points in the final period, which opened with an 8-2 run that put the Lady Hornets in control. 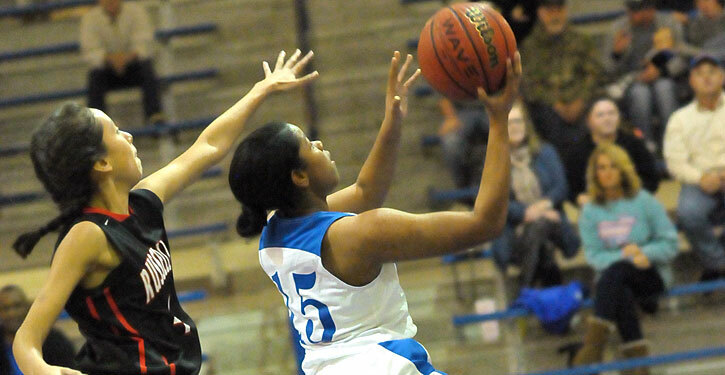 For Bryant, Tyianna Robinson came through with a season-high 13 points. Ivory Russ added 8, Celena Martin 7, Lexi Taylor 6 and Tierra Trotter 5. 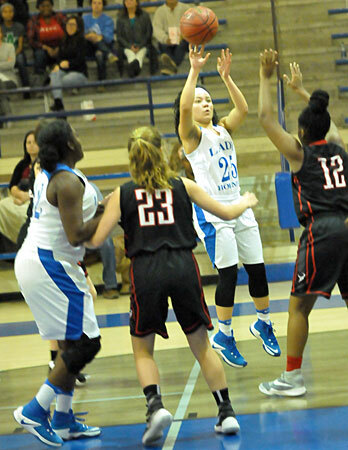 The Lady Hornets were without starting post McKenzie Muse who was nursing an injury. 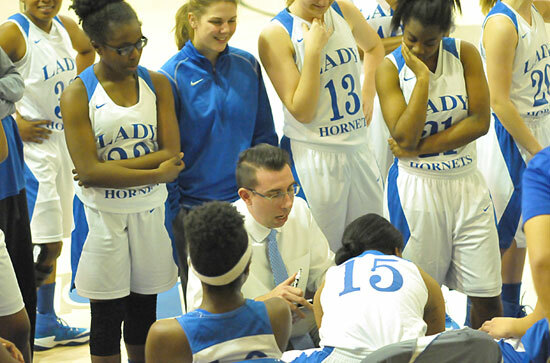 The win improved the Lady Hornets to 8-2 overall and 4-2 in conference play going into the Christmas break. They’ll return to action on Dec. 28 at the annual Kameron Hale Invitational Tournament at Lake Hamilton. “I thought, defensively, we played very well,” said Bryant head coach Nathan Castaldi. “We pressured the ball a lot better today, stayed in front then we got some people rotating in the back end of the trap to get some steals, which converted to some easy buckets. “Also, I thought — in the first half as well — we moved the basketball well to get the shots we wanted instead of settling for jump shots,” he added. Russellville’s 2-3 zone was tough so the Lady Hornets had to work to get into the middle of it or to the basket. Their patience paid off, however, and often they were able to break down the defense and get penetration. The fourth quarter push that broke the game open began with two free throws by Russ after she drove the ball. Robinson followed with a steal and layup, making it 33-21. After a timeout to save a possession the Lady Whirlwinds wound up turning the ball over anyway. After trading misses, Bryant committed a turnover and Russellville’s Megan Fleming cashed it in with a layup. But another drive by Russ produced points and when Martin made a steal and layup with 2:58 left in the game, the Lady Hornets had their largest lead of the game, 37-23. Late free throws by Taylor and Martin helped seal the victory. Russ scored the first 4 points of the game and, after Davis canned a 15-footer, Robinson pulled up for a jumper off a drive to make it 6-2. After Fleming trimmed the margin, the Lady Hornets put together a 7-1 run. A steal and layup by Robinson started it and, after Davis hit a free throw, Russ fed Robinson for a layup to make it 10-5 going into the second quarter. Robinson then opened the scoring in the new stanza by nailing a 3. Davis answered and the Lady Winds had a chance to get closer only to have Russ and Robinson combined to force a turnover. Taylor cashed in with a layup. Russellville was within 17-12 going into the final minute but Taylor knocked down a 3 to give the Lady Hornets a 20-12 advantage at the break. Davis hit a 3 to start the second half but Trotter answered with a triple, which started a Bryant surge. Davis hit a short jumper off a feed from Robinson then Trotter drove for a basket to get the lead back to double digits. Davis and Martin traded buckets before Davis finished the third quarter with a flurry to get her team within 8 going into the final period. O.Barnes 0-0 0-0 0, Davis 7-12 2-4 18, L.Barnes 0-0 0-0 0, Fleming 2-7 0-0 4, Wells 2-7 0-0 4, Nesbitt 0-0 0-0 0, Vines 0-0 0-0 0, Woods 0-2 0-0 0, Velazquez 0-0 0-0 0. Totals 11-28 2-4 26. T.Trotter 2-4 0-2 5, Martin 3-6 1-4 7, Russ 3-7 2-2 8, Robinson 6-8 0-0 13, Baker 0-1 0-0 0, Taylor 2-6 1-2 6, Oholendt 0-1 0-0 0, Scifres 0-0 0-0 0, Deaton 0-0 0-0 0. Totals 16-33 4-10 39. Three-point field goals: Bryant 3-7 (T.Trotter 1-3, Taylor 1-3, Robinson 1-1), Russellville 2-4 (Davis 2-2, Fleming 0-2). Turnovers: Bryant 17, Russellville 22. Rebounds: Bryant 9-13 22 (Martin 3-2 5, Russ 2-2 4, Robinson 0-4 4, Baker 1-2 3, T.Trotter 0-1 1, Taylor 0-1 1, Oholendt 1-0 1, team 2-1 3), Russellville: 6-8 14 (Wells 4-2 6, Davis 0-4 4, Nesbitt 1-1 2, Vines 0-1 1, Woods 1-0 1). Team fouls: Bryant 6, Russellville 11. Fouled out: Russellville, Wells.